Hair always seems to grow in places where we don’t want it. When you need to look your best, a bulky electric shaver isn’t going to work to remove pesky nose, or ear hairs that are sticking out. While others may not notice them, you know they’re there, and they must be removed. The Panasonic ER-GN30-K is an affordable nose and ear hair trimmer, designed to get into these tiny regions. It fits easily into the hand, and has a silver, black, and blue plastic elongated and curved body casing. 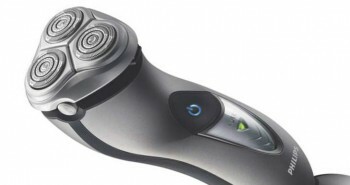 This trimmer has a built-in Vortex cleaning system, so you won’t have to worry about hairs jamming it up. It can be used with water, or only dry. To wash it, you simply rinse it under the tap, and shake to dry. Its casing is 100% waterproof, so you don’t have to worry about moisture ruining its motor. 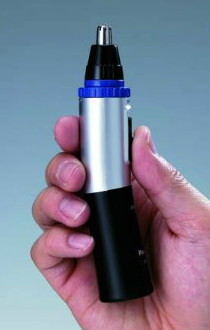 The Panasonic ER-GN30-K is built with ergonomics in mind. Its curved shape allows you to hold the trimmer in your hand, without dropping it in the sink, even when it’s slipper and wet. You can easily manipulate it with your hands, to reach all those tiny regions of your nose or ears, where hairs are sticking out. You can cut hair off at a variety of different angles, with a minimum of fuss. You can also use it on your eyebrows. 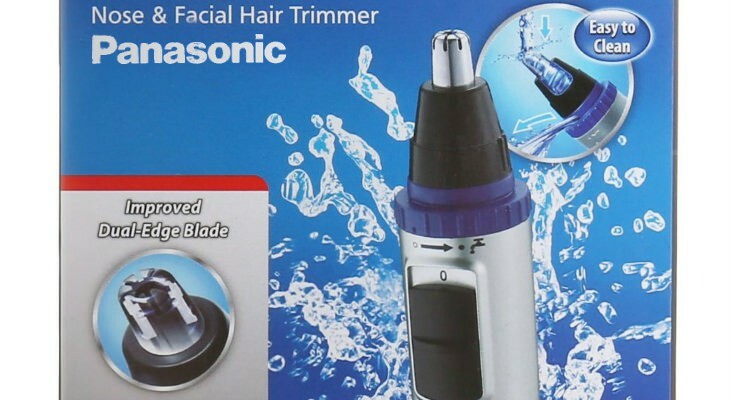 This Pansonic trimmer is built with a special blade. It’s dual-edge, and it is hypo-allergenic, to reduce allergic reactions to people who may be allergic to metals such as nickel. The blade is built in at a sixty degree angle. 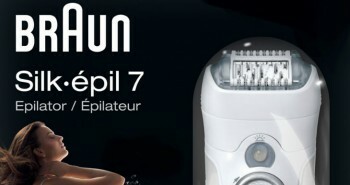 The blade is designed to effectively cut all hairs in its path, without tugging or yanking them out. The Panasonic ER-GN30-K runs on one double A (AA) battery. You’ll need to add batteries to your order, as none are included in the packaging. New batteries will give you about ninety minutes of run time. You can always purchase rechargeable batteries, which are better for the environment. 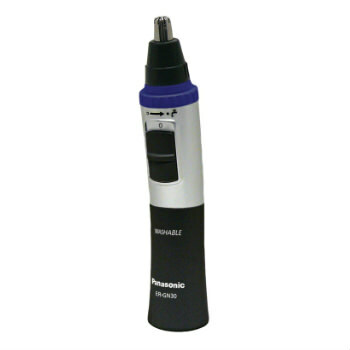 The Panasonic ER-GN30-K is small enough to take on the road with you, or to keep at home in your bathroom cabinet. It’s quite light, and only weighs 2.2 ounces. Inside the box you’ll receive one Panasonic ER-GN30-K nose and ear hair trimmer, one protective cap, and one cleaning brush. 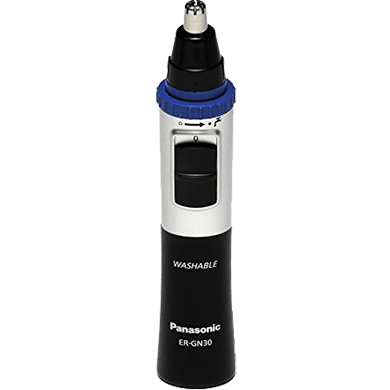 While there is a replacement blade part available, if your trimmer becomes dull, it costs as much as a new Panasonic ER-GN30-K, so you may just be better off buying a new one. You may find that your trimmer stops working after several months of use, and it’s not backed up by a warranty at all. It will slowly die down, until it stops working. 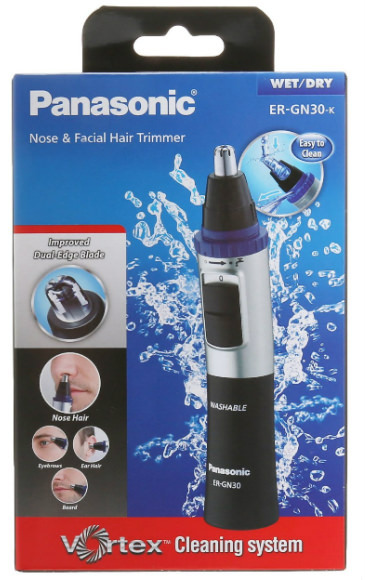 If you need to trim facial hair that can’t be trimmed with your cordless razor, the Panasonic ER-GN30-K ear and nose hair trimmer will work perfectly for you. It may not last forever, but it’s easily replaceable. You may wish to buy two, just in case.